AND feeling very Cared About. Loving how fast the time flies. Except the book needs to be published before books are obsolete. Oh, right. Must write it, illustrate it. As for celebrating with friends like that time three years ago at True’s house: no. More than one party every five years is unseemly at a certain age. BUT I am looking forward to another self-produced surprise party (since no one RSVPs, every party is a surprise, isn’t it?) next year. Theme: Ain’t it good to be alive? 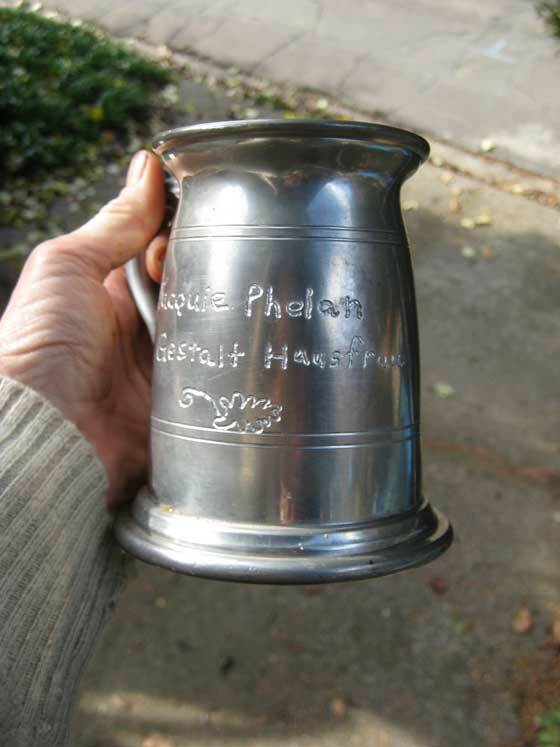 Yesterday Charlie personalized my (fathomless) English pewter mug, rescued from dumpster down the street. 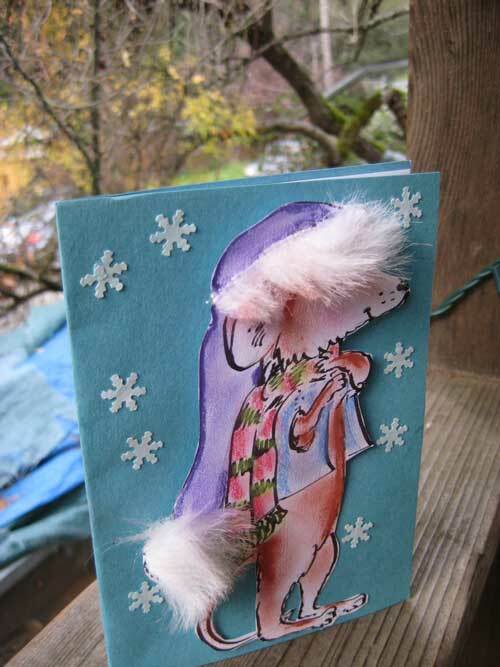 Upon presenting it to me yesterday (we both thought yesterday was the tenth of December) he said, “there’s a story”. He pointed to a little bleb of silver on the inside of the cup. He started with the ‘n’ because the way the dremel turned meant going right to left, which also means he could see where he was cutting. All this because the trouble and expense of ‘real’ engraving, with all the flourishes I felt I needed, were too much.. This lives at the local pub. Clear glass bottom. Very cool. ~ by jacquiephelan on December 10, 2009. Aw… that is a beautiful inscription. Hope you’re having a wonderful Birthday. JC and I send our very best. The story makes the engraving that much better, but especially the little bit of bleb of silver solder. Happy Birthday! I don’t go to parties if I can help it. I went to one just a few weeks ago and declared it to be the last one I’d attend for….ever? I love the title that C.C. has bestowed upon you.